This picture shows five generations of one family–and the infant who is the fifth generation perhaps has more living grandparents than any other child in the Ozarks; certainly more than most for she has 11. In the center of the picture is Mrs. D. L. Brewer, 87, of Arcola, the baby’s great-greatgrandmother. At the left in the middle row is her son, Dan Brewer, 61, of Arcola; his wife is just below him at the left in the front row. They are the baby’s great-grandparents. 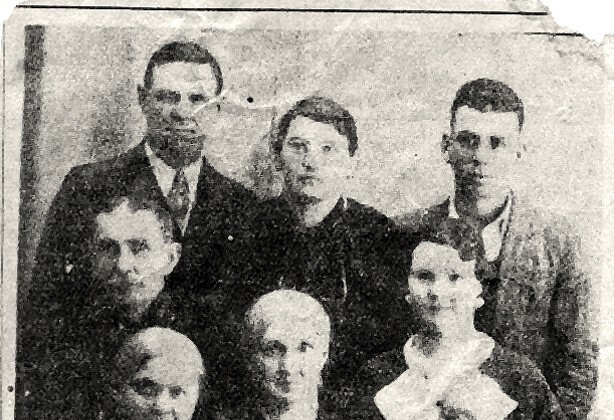 At the top left and center are Mr. and Mrs. Schuyler Brewer, the infant’s grandparents, also of Arcola. Mr. Brewer is 40. 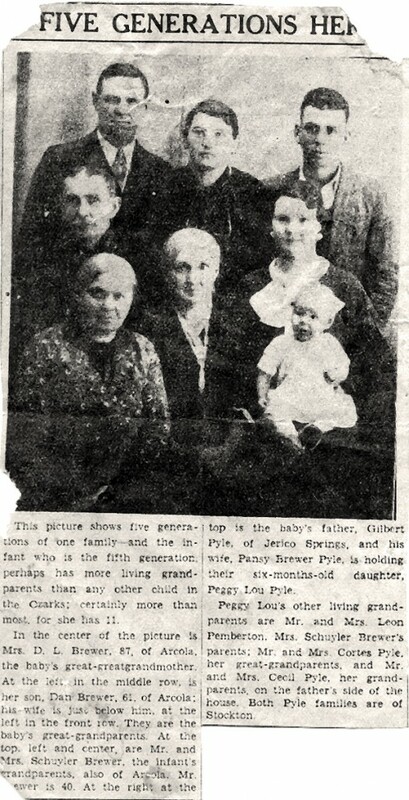 At the right of the top is the baby’s father, Gilbert Pyle, of Jerico Springs, and his wife, Pansy Brewer Pyle, is holding their six-months-old daughter, Peggy Lou Pyle. Peggy Lou’s other living grandparents are Mr. and Mrs. Leon Pemberton, Mrs. Schuyler Brewer’s parents; Mr. and Mrs. Cortes Pyle, her great-grandparents, and Mr. and Mrs. Cecil Pyle, her grandparents, on the father’s side of the house. Both Pyle families are of Stockton. Delana Louise Jane Fowler Brewer (grandmother of Dorothy Noyes mcKenney) was born in 1854 and died in 1939 at the age of 85, so the article is wrong as to her age. Her son Daniel was born in 1874 in Barton county, Missouri and was 61 in 1935, so I’ll place this article as being in 1935. His wife was Rose Trent b. 1878 in KS and died in 1948. They were married March 25 1895 in Girard, Crawford, Kansas. Daniel and Rose had two children, Schuyler b. abt 1897 and Davie b. abt 1902. Schuyler married Gladys Pemberton who was born abt 1899 in Missouri. They had three children: Odilla b. abt 1915, Pansy b. abt 1917 and Schuyler Jr. b. abt 1919. Pansy married Gilbert C. Pyle. Schuyler’s uncle, Robert Walter Brewer, was married to an Edith S. Gilmore. I think it likely that Andrew was a relation. Category: Noyes line, Noyes line photos, Uncategorized · Tags: cecil pyle, cortes pyle, daniel brewer, davie brewer, delana fowler brewer, gilbert c. pyle, gladys pemberton brewer, leon pemberton, odilla brewer, pansy brewer pyle, peggy lou pyle, ralph brewer, rose trent brewer, schuyler brewer, schuyler brewer jr.